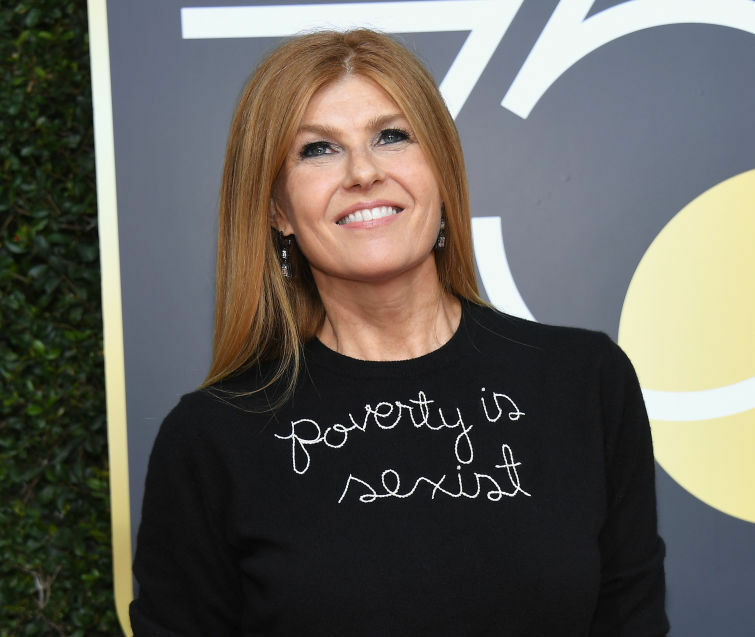 This is why Connie Britton's Golden Globes look says "poverty is sexist"
Tonight, our eyes are on the 2018 Golden Globes: a celebration of the finest moments (and participants) in American film and television. Many women, including Tracee Ellis Ross and #MeToo movement creator Tarana Burke, are wearing all black to honor victims of sexual abuse. One of the celebrities who’s using style to raise awareness tonight is Connie Britton. She’s rocking a black sweatshirt, which has “Poverty is sexist” embroidered in cursive across the chest. It is amazing enough that she’s using her platform to call out sexual misconduct. However, it speaks volumes that Britton is using tonight to also speak on the correlation between gender and pay. "My hope with this movement now is that we get to the next level, that we're really reaching out to the grassroots and we're really reaching out to women all over who have been impacted by these situations and by sexual harassment and lack of gender parity." However, author and speaker Jessica Valenti pointed out the price of the sweatshirt, saying that it costs a whopping $400. But some of the proceeds from the top go to charity, which is a relief. Ultimately, it is of major importance that Connie Britton understands the intersection of poverty, abuse, and gender.